You can borrow SOLIDWORKS licenses from the SolidNetwork License Manager so the license is available on a machine when not connected to your network. You need to be connected to your network that has the SOLIDWORKS licenses. Then you can open the SolidNetwork License Manager on the client machine. 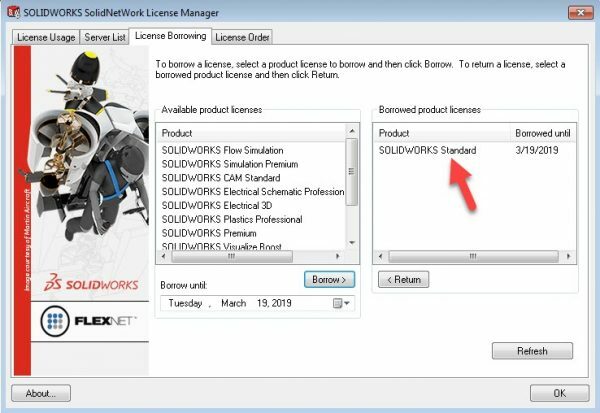 This can be found under Start > All Programs > SolidWorks [year] > SolidWorks Tools > SolidNetwork License Manager. There should be 4 tabs at the top. Select “License Borrowing”. The list of products that have an available license will be shown in the list. Select the one required. Select the last day you will need the license. Licenses are limited to a 30-day maximum borrow period. This maximum period can be shortened using an Options file. SOLIDWORKS will be available for use through to 11:59pm on the day specified. At midnight of the following day, the license will expire on the client laptop and the license will be freed up on the server. Once you have selected a product and the borrow until date, click Borrow. It is highly recommended to be connected to the network with an ethernet connection (rather than wireless). This will show the license under the Borrowed Product Licenses window. You will see that a Standard License was automatically borrowed. Any borrowed licenses will not be available in the network pool until it is returned. If you get back to the office before the date specified, you can manually return the license. Then select the license in the Borrowed Product Licenses list and click Return. The license will be returned and become available to the network pool. How do I upgrade the SOLIDWORKS SolidNetWork License Manager?